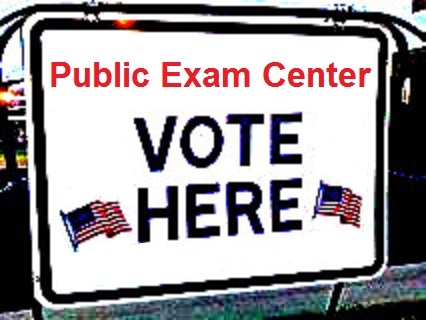 The following information was created for a page with the title "Public Exam Center" intended for the Cenocracy.org site regarding the activity of voting. It is reproduced here because of its "three" format, and thus may be of some interest to those dabbling in the "threes" area of research. Your Voting ability is being tested today. 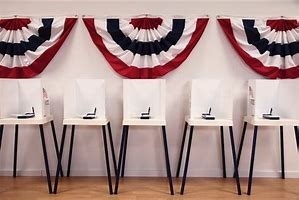 Only those whom are handicapped may sit down because they are a small minority of voters anyway. The popular vote doesn't matter because it can be undermined by gerrymandering and the Electoral college. You are being tested for how well you can remember which candidate's or political party's biases are most believable. Your personal opinions don't really matter, only the expressions of which can be reflexively brought to the surface from your memory of the time you spent being brainwashed by a social media bought and paid for by those candidates backed up with the most creative accounting abilities of their sponsors. Voting ballots are intentionally designed public (idiocy) tests like so many others used to access varying types and levels of one's competency, compliance, commitment, complacency, commensurableness, communalism, conscientiousness, contemporaneousness, certifiableness, commonality, compatibility, and general conspecificity of like... or unlike-mindedness. Marriage license tests (allowing a person to test the feasibility of compatibility with another over a protracted period of time). Generally speaking, classroom tests fall under two categories called subjective and objective (subject-centered and object-centered)— to which are aligned three types of assessment values called diagnostic, formative and summative... which describe a means to identify developmentally progressive levels of memorization, knowledge, intelligence and experience... (wisdom, creativity, genius, talent, insight, intuition, etc., are not- necessarily -withstanding). 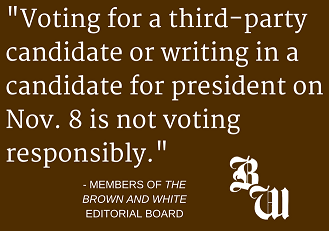 A second type of test which is a step just above the simplistic two-party true/false variety, is to be found in those ballots offering multiple choices, which may include the provision for a write-in candidate. This type of test measures a a slightly greater level of memorization and knowledge and requires a "notched upward" level of an academic or self-educated concentration, contemplation, and comprehension. A third type of test, with respect to the basic alternatives being provided in this context, requires an expanded level of memorization, knowledge, intelligence and experience and is called the essay. It requires and advanced level of concentration, contemplation, and comprehension very often found amongst those with an above-average I.Q., found in many different day-to-day settings, not to mention various professional endeavours as well. Unfortunately, because of the primitive socio-politico-economic structure being practiced in the present culture, this advanced testing methodology is not currently being offered because it would permit the public using the ballot box as a platform upon which to voice a collective opinion about any and all social issue grievances that are not being adequately redressed by the government. It would provide the public with a defensible rationale for protesting various government deficiencies, thus placing politicians on the spot to provide answers they couldn't squirm out of. Using the ballot as a protest mechanism involves a model of literate competency and comprehensiveness which would reveal that the public (students) have exceeded the presumed talent and erudite teachings of the self-entitled political masters. Political campaigns are a type of teaching methodology geared towards instructing the public in superficial and biased types of knowledge often rendered in the format of a slogan that a politician hopes will become stuck in the ears of the public like the occasional melody of a song that can crop up and stay with a person for awhile... no matter what they do to try and shake it out of memory. Campaigns are practice exercises of an on-the-fly pedagogy (teaching methodology) where very little intellect is required since most politicians don't want to place themselves in a position of exhibiting how much they don't actually know, and that many political offices are status quo managerial positions where very little above-average thinking is required... but that a carnival barker type of salesmanship is highly desired. Hence, we have a society that can not progress because even though many in the public stands eagerly on a path at the cross-roads of a greater enlightenment and consciousness-of-being, they are being confronted by a series of potholes, detour and 'bridge-out' signs, because the training for political engineers advances the reality that there are no public or private centers of education which are principally founded and formatted on instructing the developmental course of those pursuing a political career. Whereas we have schools for journalists, chemists, physicists, mathematicians, medical professionals, sports professionals, etc., the on-the-job training program for political service is haphazard at best. You would think that an educated public would demand that their political leaders have more than a bare modicum of knowledge and thinking skills so that the general public perception of politicians would not be one in which it is recognized that the government is being run by a cadre of incompetents who have learned various efficiencies of covering up their inadequacies. There is a very serious socio-political problem afoot that needs to be corrected. If the only way to do so is by a riotous rebellion of revolution, then so be it.